There is chilli and there is Texas chilli, baby! In this country, most of us have eaten the former – about a gazillion times. Made with mince and a little chilli powder, it’s very nice thank you. But it’s not the real deal, the stuff they have fierce competitions about in Texas. Now, I haven’t been to Texas you understand, although we do own the Rough Guide to Texas and we WILL go, one day. But I have been thinking about that type of chilli, the Texas kind, for a while now. So, I eventually got around to making one. Or making two should I say, since we’ve had it twice recently. 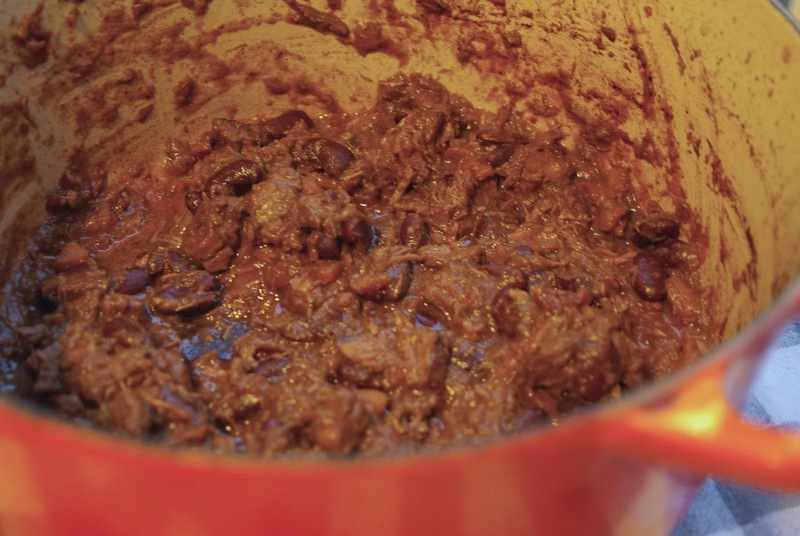 There are some key distinguishing features of a specifically Texas-style chilli: the use of chuck steak; proper chilli flavour created by pulverising flavoursome dried chillies with water to make a paste; the inclusion of beer; and the use of spices in addition to chilli. I looked around at several online recipes and also in an American book about slow cooking that I bought from a charity shop recently (best place to buy cookery books from by the way), and I came up with this. I have also addressed a common problem with making chilli for the family or for a group with children in – to include or omit the heat. 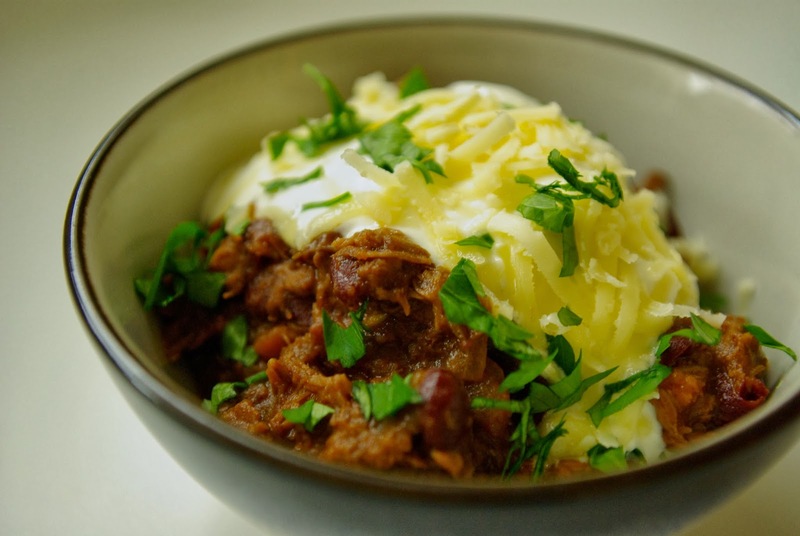 I find that UK style chilli con carne, when cooked without the heat, is a bit like mince stew. It’s OK to eat, it really is. But it’s just not chilli. So, I’ve created a recipe that still has the smokey, spiced rather than spicy chilli vibe, but that doesn’t have the child-offending heat. Although I stand by my opinion that a little heat is good for children, as that’s they best way to get them used to it. This child friendly flavour comes via the cumin, smoked paprika and cinnamon. If you are serving adults, add the chilli paste whilst cooking, if serving kids then simply serve the paste as an accompaniment, it works as a kind of sauce too (or just don’t bother with it). Preheat your oven to around 130C. You have at least 50 minutes’ cooking to do so you needn’t do this right at the start! 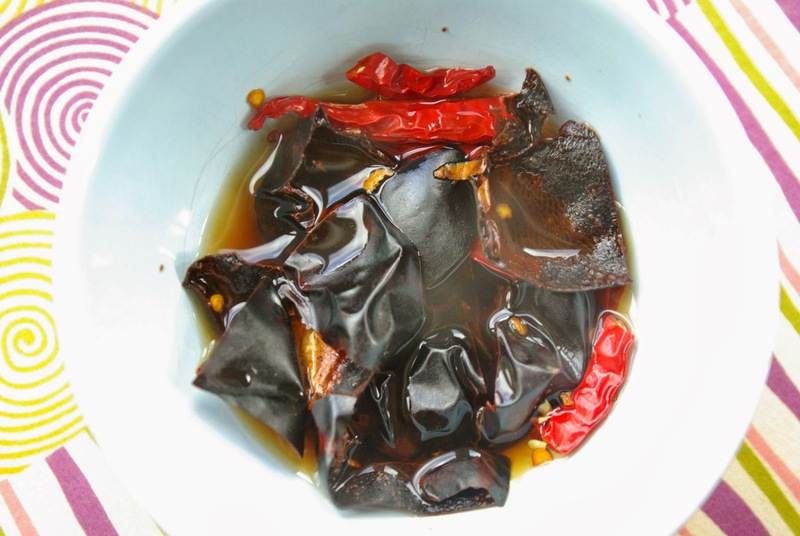 (If you want to make this with the chilli paste) place your dried chillies of choice in a small bowl with enough boiled water to cover and allow to steep. Set aside till later. Put your meat to one side. Your pan should now have lots of lovely brown colour in it (see photo). Over a low heat add some more oil and toss in your carrots, onions and garlic. Let this cook for about 25 minutes, getting really soft, sweet and caramelised. Whilst your veg is softening, if you chose to make with chilli, then now is the time to whizz it in a processor – the small ones are perfect for this but a large one will do it too. Add your spices and cook them out gently for a further 5 minutes. Now your tomato puree also. 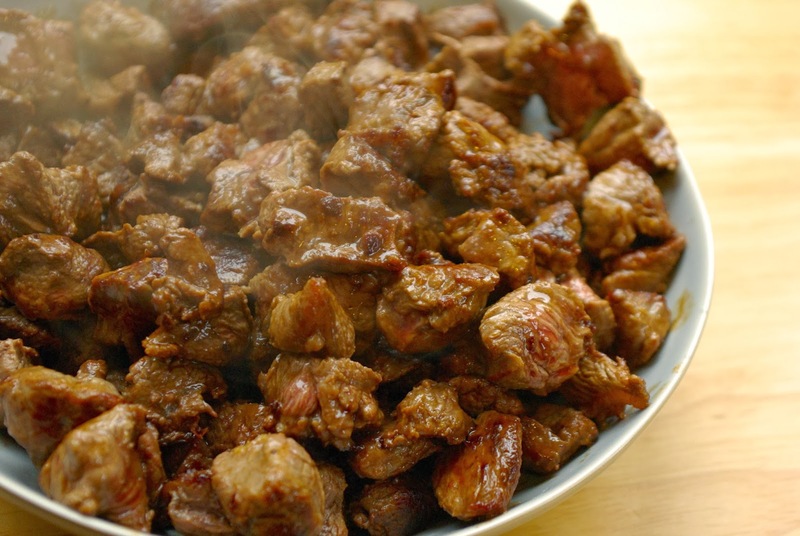 Tip your meat back in and stir to coat thoroughly. 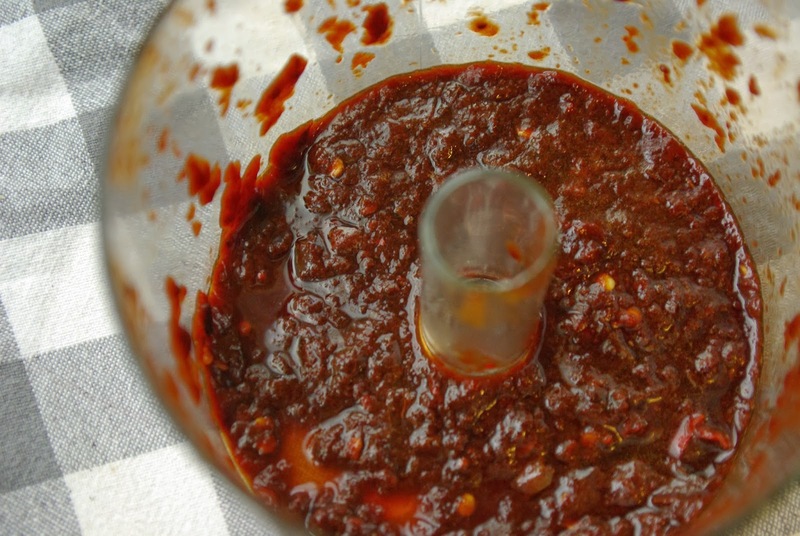 If you are adding the chilli paste, do it now. Judge for yourself how much you want to add. I would say that the long cooking does mellow it so be braver than you may feel inclined to be naturally! Pour in your beer and hot stock and bring to the boil. Tip in your kidney beans. Cover with a tight fitting lid and place in the oven to simmer for 3 hours. Stir every hour. I throw in my potatoes to bake alongside after the first hour has passed. 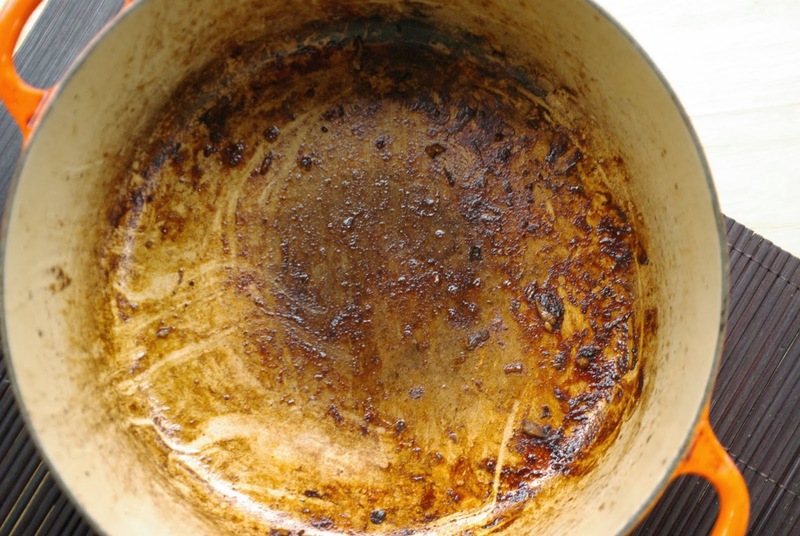 When almost ready to serve, take out the pan and place back on the hob with the lid off over a medium flame to reduce and thicken a little. I like my chilli really thick and unctuous; the amount you let it thicken is up to you. A few minutes without the lid is all it needs. Serve with all the bits and bobs. We ate it with mature cheese, sour cream, jackets and extra jalapeños. But it would be good too with guacamole, tortilla chips and cornbread… maybe next time.